Cover Reads: Jesus-Jesus Bo-Besus! Banana-Fanna Fo-Fesus! Fi-Fi-Mo-Mesus! Jesus! 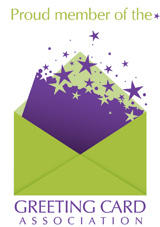 Inside Reads: Having A Merry Christmas Is The Name Of The Game! So, imagine the night Jesus was born. The wise men and the shepherds were gathered around. The night was still and holy. They all leaned over and gazed in awe at Jesus in manger, so tender and mild. And then silent night became, well, not so silent. Everyone � including the Magi, Mary and Joseph � broke out in that iconic late-�70s name game. 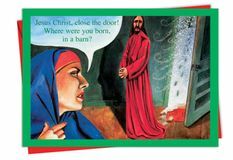 Jesus greeting card jokes always make for a wonderfully silly holiday greeting, because �tis the reason for the season, and all that. And lucky for you, NobleWorks Cards has a ton of Jesus greeting cards and other funny, dirty Christmas cards � if you�re into that sort of thing. Keep the holidays merry and bright, we say. Add a little humorous banter into the equation and lighten up. Because, as you know, Christmas manger jokes are about as topical as it gets. 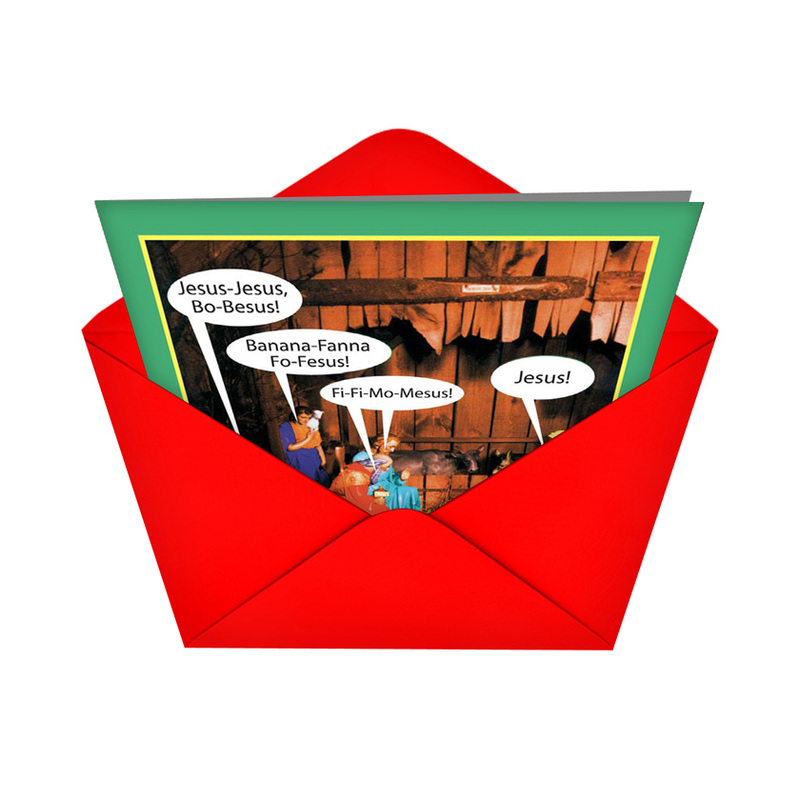 NobleWorks� Jesus-in-a-manger card is a perfect, funny Christmas greeting card for both your religious and non-religious peeps. 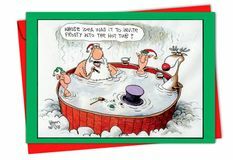 And if they�re offended, well, maybe Santa will put a little sense of humor in their stockings. Sometimes, the only way to help people resolve their stuffy attitudes toward Christmas is to be overtly non-politically correct. Most likely, the first person to laugh at good Jesus jokes was the Man himself. I bet He was a super-cool dude. He clearly had a thing for wine, as do I. I imagine we�d get along great. We would share my box of wine, get a little tipsy, and laugh about the absurdities of the world. 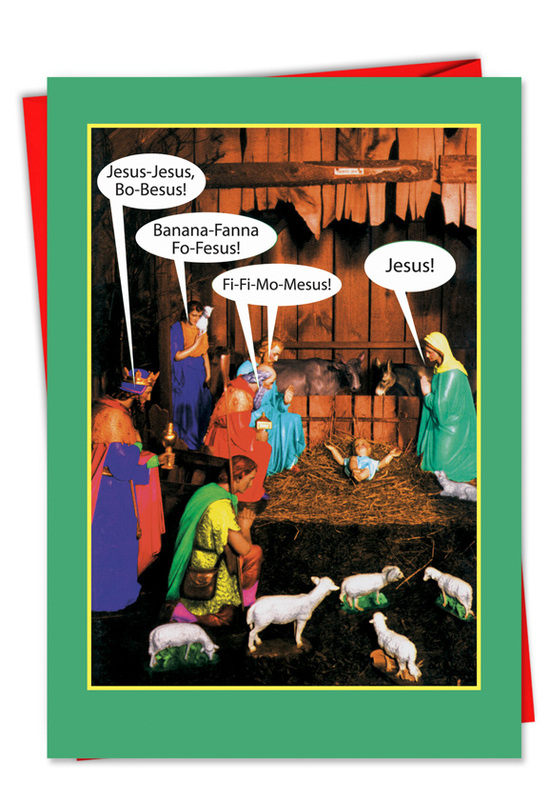 It�s doubtful Jesus would get too offended at a silly Christmas card. Everyone I gave this card to, laughed and loved it! All Nobleworks cards are da bomb!